I found these buttery soft Nordstrom loafers last week at the Salvation Army. They were $2. The color wasn't my favorite but I loved how soft the leather felt and they were in really good condition. 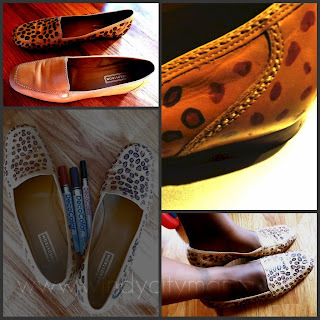 While I was thinking of what I could do to spruce them up, I found and re-pinned these Steve Madden Loafers. They became my inspiration. I went to Blick, bought fabric paint pens (plus some other goodies) and went to work. I still have some tweaking to do and mistakes to correct. I think they are super awesome though. They add a bit of interest to the mom uniform. I will be trying this again, maybe zebra print next time! Any animal print fans out there? And in related news: I've created my own disinfection system for the un-washable thrift items. Sunshine (uv rays); a disinfecting spritz (mineral deodorant spray, lemon juice, vinegar, and cheap vodka); 15 mins in dryer with a dryer sheet (cloth only). Works great! How do you clean/disinfect your thrifty finds? How clever. I would've never thought. You did a great job. I haven't found any shoes on my thrifting ventures yet. The clothes I wash or send to the cleaners. I will keep this in mind if I come across something...thanks for specifying the vodka can be cheap! @Mimi Thanks! I rarely go to the cleaners. I will try to wash everything once. :) I probably should have explained that somewhere in there. I'm frugal (ie cheap) like that. This is awesome! Thanks for linking up to thriftaholics weekly! :) Hope to see you there next week! GREAT idea! I LOVE these! Found you via thriftaholics weekly. Thanks Ladies! I will be linking up again. Love looking at all the awesome thrifted finds. Very nice job...and what a score for $2!! !